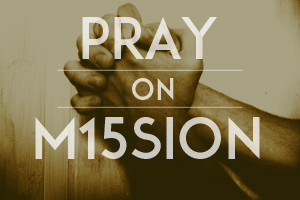 Whether you began praying with us in January 2015 or are picking up this card later in the year we invite you to join us to pray on mission each day. Imagine what God will do, the people He will reach, and the power you experience when we keep praying! I pray my love for God grows as I hear from God through reading His Word today. I will tell God what is on my heart today. I pray for those by name in my life who do not yet know Christ. I pray for courage to lovingly speak the gospel should the opportunity arise today. I pray God would give me opportunities to invite my friends/family to our worship service or church activities. I pray I would be open today to meet the new people God may be bring into my life. I pray for our worship service tomorrow that all visitors and church family would feel welcome by myself and the rest of the church family.